India again successfully test-fired a nuclear-capable missile Sunday that can hit targets across much of Asia and the Middle East, a defense ministry press release said. "The Agni III missile tested for the full range, hit the target with pinpoint accuracy and met all the mission objectives," the press release added, The Associated Press reports. According to Economic Times, the missile, developed by the Defence Research and Development Organisation (DRDO), is capable of carrying warheads weighing up to 1.5 tonne, is 17 metres tall and has a launch weight of 50 tonne with a two-metre diameter. It was tested on Sunday morning from the Inner Wheeler Island at Dhamra, a launch site in Bhadrak district around 200 km from Orissa capital Bhubaneswar. One of the country’s most powerful missile, it has the capability to hit deep inside China, bringing cities like Shanghai and Beijing within its reach. The missile, which has a two-stage solid propellant system, reached a peak height of 350 km during the course of flight and reentered the atmosphere successfully, tolerating surface temperatures that reached nearly 3,000 degree celsius. 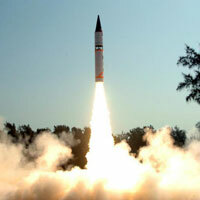 "The fourth test-firing of the Agni-III missile was carried out at 1050 hours today. It was for the full range and it hit the target with pin-point accuracy and met all the mission objectives," Defence Ministry spokesman Sitanshu Kar said in New Delhi. Two Navy ships located near the target tracked and witnessed the missile hitting it accurately, he said. During today's launch, the missile was fired from a mobile rail launcher, sources in Balasore said, Hindustan Times reports.